Brand new and sealed 1 Ounce Platinum Bullion 999.5 Fine Valcambi bar. Each bar is supplied sealed in its original Valcambi packaging with a serial number engraved on the bar and in the matching assay certificate. Valcambi is one of Switzerland's leading precious metals refineries, operating out of southern Switzerland in Balerna. The company has been refining precious metals since the early 1960's. In addition to producing precious metals for banks, such as Credit Suisse, Valcambi also produces precious metals for industrial use. 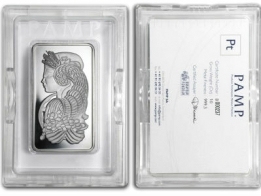 The 1 Ounce Platinum bar produced by Valcambi was only recently released. In addition to the 1 Ounce Platinum bar, Valcambi also produces a 'combi-bar', which is 50 x 1 gram Valcambi platinum bars that can be broken into individual bars. The bar is designed to fit into your wallet. 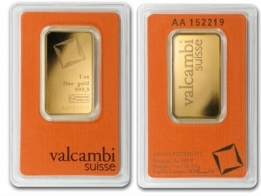 Valcambi also produces a number of gold and silver bars. Gold bars produced by Valcambi range in size from 1 gram to 1 kg, and silver bars from 1 Ounce to 1 Kilogram. Bar supplied will be either Credit Suisse or Valcambi. 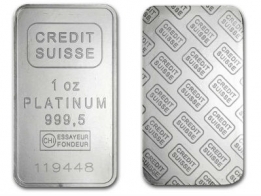 The Valcambi 1 Ounce platinum bar is one of the lowest premium platinum bars currently available from Suisse Gold, and is offered at a furthe discount via our Zurich Bullion Vault service. 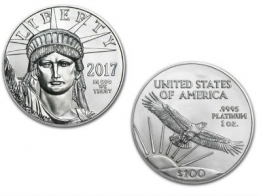 To view the current platinum price, please click here.